1) It can create health problems for the critters. Human food doesn’t always have the nutrients found in the food that make up the local wildlife’s specialized diet. If the wrong food is given for even just a short period of time, it may cause developmental problems for the animals in question. The components of a safe diet can be found online, but remember, feeding wildlife causes them to return and that can become overwhelming and unsafe. When wild animals locate a constant food source, they “spread the word.” When they gather in large numbers for food, it creates completion amongst them. The crowding that occurs is unnatural for most critters, and can cause fighting and injuries. Subsequently this can lead to the spread of diseases which are transmittable to humans and their pets. Feeding can become fatal for wild life if it leads to behavioral changes. The constant food source can prevent critters from migrating when weather conditions aren’t optimal, and it may lead to harmful interaction amongst animals that aren’t usually competing for food. In some counties, it is illegal to feed all wildlife. However, the Florida Fish and Wildlife Conservation Commission prohibits the feeding of specific wildlife throughout the entire state. Breaking these laws can result in fines as high as $5,000 or incarceration of up to 5 years. Intentionally or inadvertently feeding wildlife can become problematic if it leads to home invasions. Raccoons for example invade attics to escape the elements or to give birth. If your home is their source of food, it may also be their choice of residence. If you care about the local wildlife, the best thing to do is not give them handouts. 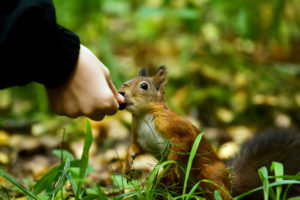 If you are seeking a way to get closer to them, then search for wildlife rehabilitation centers in your area that allow you to safely touch and feed these animals. If you weren’t aware of the dangers and feeding the wildlife in your backyard has become overbearing, give the experts at Critter Control® of Miami a call at 305-258-3587 to help. Once the infestation is taken care of we offer a 3 year warranty on the exclusion work. Don’t forget to ask about our lifetime warranty. We offer custom solutions to fit everyone’s needs.